One of the newest shopping experiences to be added to Downtown Disney at the Walt Disney World Resort is called Tren-D. The 2,500 sqft boutique is an urban-inspired, hip destination for fashion-conscious shoppers seeking trendy apparel and novel accessories. 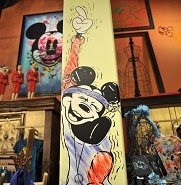 The new store combines designer items with Disney art, apparel, and accessories. Some of the designers represented in the store include: Kidada Jones, Tarina Tarantino and Roxy. Most of the merchandise that you will see here is not offered anywhere else. This is the place to find stylish items that you would not previously find at Disney World. Where else would you find embroidered handbags and jeweled sunglasses, along with unique Disney artwork and trendy assessories? Tren-D is located in the Downtown Disney Marketplace area between Pin Traders, and Once Upon A Toy. For those of you yearning for a different Disney shopping experience that is trendier than the usual Disney fare that you would find in the World of Disney, Tren-D may be the place or you. Why don’t you check it out during your next vacation? You may find just the item you have been looking for. 0 comments to "Tren-D Creates New Shopping Experience at Downtown Disney"